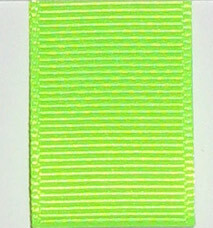 Grosgrain Ribbon (Solid) - Key Lime. Please check availability before ordering. Lead time could be up to 4 weeks if item is not in stock. Available in the following widths: 1/4", 3/8", 5/8", 7/8", 1 1/2", 2 1/4". Other widths available as special order. Please contact us for details.